Mmmm . . . unexpected lambic. Back in 2001, 2002, and 2003, I brewed at least a couple batches of lambic each year. In 2004, I blended some one-year-old, two-year-old, and three-year old lambic to make a gueuze (a blended lambic). The beer turned out well. It won Best of Show at the 2004 Austin ZEALOTS Inquisition. And, I had 15 gallons (57 L) of it as each blender was 5 gallons (19 L) in volume. There are better gueuze blending strategies than this, but at the time I did not know them. Even so, this was one of the coolest things I ever did as a homebrewer, and I even wrote about it awhile ago. With 15 gallons (57 L) of beer into to put into bottles, I had to scrounge around to find every available package I had. Along with a few cases of 22-ounce (650-mL) bottles, I ended up using several 1 L bombers to hold some of the beer. After bottling, I set the 1 L bombers aside . . . and forgot about them. A couple weeks ago, while scrounging around my brewing equipment, I found them. So, suddenly I had six bombers of gueuze that was 10 years old. I immediately put one of the bottles in my fridge, let it cool overnight, and sampled it the next evening. I sampled a couple other bottles in the past few weeks, too. Here is what I found. The Rye Wit is light, hoppy and refreshing. 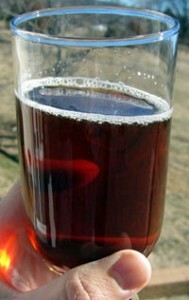 As seen in the article detailing its brewing, the “Rye Wit” had a shockingly low starting gravity of 1.018. My hydrometer says it finished at 1.008, giving it an alcohol by volume of 1.3%. 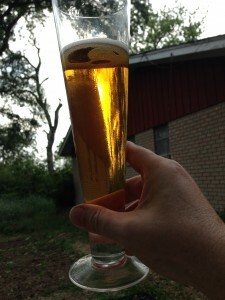 According to the BrewMath iPhone app, the calorie count for this lightweight is 76. Thanks to the magical properties of rye, the body of the beer is satisfying. It would in no way be mistaken for a high gravity beer, but at the same time, it’s not watery. 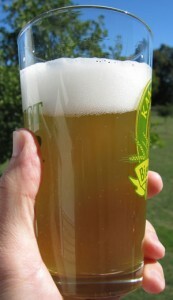 I hopped the beer in the keg with an ounce (28 grams) of Cascade pellets. This, combined with the ounce of Mosaic pellets at flameout, gives the Rye Wit a very nice hoppy aroma. It’s a little grassy around the edges, but as a hop lover, that suits me just fine. The flavor is all about the hops. Again, it’s not an IPA, but it’s not trying to be. The hops are a bit lemony and piney with a bit of resin in there, too. The beer is very thirst quenching, which is one reason it’s not going to last very long. I’d call the color a cloudy straw with a voluminous white head. It’s something you’d expect from a beer that’s nothing but wheat and rye. I’d love to brew this again with Citra hops. Or, maybe with Amarillo. Both. This is the exciting part of homebrewing. When I brewed this beer (see brewing details here), it was a matter of improvisation. A bit of two-row and rye here, a bit of American hops and saison yeast there. I was hoping the combination would be a synergy of the ingredients to produce something new (for me) and fun. The end result is not disappointing. 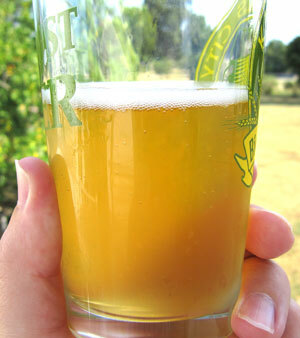 As you might expect from the recipe, the Amarillo and Mosaic hops added at the end of the boil dominate the flavor. I taste grapefruit, tropical fruit, and a bit of lemon. The aroma, too, is hop forward.